What is the Indoor Pet Pen? The Indoor Pet Pen is a lightweight and portable play area that sets up in seconds. Best of all, no tools are required! The top door and window panels on all sides are made of nylon fabric and mesh to help your pet see out and allow fresh air in. The Indoor Pet Pen is perfect for home use or for visiting friends and family. Folded compact design takes up little space when being stored. Elastic band on the side keeps play pen folded. How does the Indoor Pet Pen work? The Indoor Pet Pen is great for traveling and/or home use. 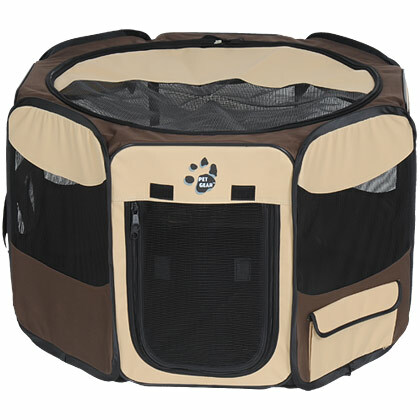 Water-resistant material makes the Indoor Pet Pen perfect for indoor or outdoor environments. Not intended to be used as a restraining device for aggressive or dangerous pets that dig, chew or paw aggressively. Do not leave your pet unattended. Remove all collars and leashes while using this product. Do not use or rest near an open or exposed flame. Unfold the Indoor Pet Pen on safe, level floor or ground. Place your pet in the appropriately sized pet pen, as recommended below. Do not leave your pet unattended. For safety, remove all collars and leashes from your pet while he or she is using this product. Indoor Pet Pen - Size Small 29"
Maltese, Chihuahua, Yorkshire Terrier, Pomeranian, small- and medium-size cats. Indoor Pet Pen - Size Medium 36"
Dachshund, West Highland Terrier, Pembroke Welsh Corgi, Pug, large cats. Indoor Pet Pen - Size Large 46"
Do not use or rest near an open or exposed flame. Colors: Sahara, Sage, and Pink.